Both of my parents were chefs growing up, so you can understand where my love of food came from. My sisters and I were the only children that would eat foods such as lobster, shrimp, and steak on a regular basis, and we would almost always pass on the standard kid fare of chicken nuggets. As I grew into my teenage years, I stopped being so adventurous with my dining options and became a creature of habit; once I found something that I liked, I stuck with it. That was until I met my husband. Since our first date, he has always encouraged me to try new things, and he brought me out of my eating rut. Together, we started making a list of local restaurants, a list I refer to as the “Eat & Drink Your Way Through Melbourne” list. It has several restaurants that I love to frequent in town. Today, I am very happy to share my list with you as I certainly think these restaurants and dishes are something that everyone should experience during their visit to Florida’s Space Coast. Squid Lips offers an excellent waterfront dining experience, and their atmosphere is just what you need to relax on a Friday night. Overlooking the Indian River, Squid Lips offers comfortable inside-dining along with a riverfront bar area for when you want to enjoy the sunshine and soak up the rays. They offer so many amazing dishes for people with all types of tastes buds, but my all time favorite is their Lobster & Crab Cake. It offers a lobster and blue crab meat combination that is blended with spices and served either fried or sautéed. I prefer it sautéed, and I typically get the double cake because the single cake just isn’t enough. If you are looking for something a bit more simple, don’t worry; Squid Lips offers amazing fish sandwiches at fair prices. I would consider Squid Lips to be a mid-range priced option where you can get sandwiches around $10 - $12, and entrees will range from about $15 - $20. Bonefish Willy’s is a local family-owned and operated riverfront grille in Melbourne. As an indoor & outdoor dining and dockside tiki bar, it’s another great choice on my “Eat & Drink Your Way Through Melbourne” list. Bonefish Willy’s offers great Happy Hour specials everyday from 2 p.m. – 6 p.m., and my favorite spot to be is on their 130-foot dock, enjoying the view of the Indian River. I typically get an appetizer and one of their cold & frozen Pina Coladas. This helps set the mood for relaxation. After I have had one or maybe two drinks, it’s time for my entree, and I have two favorites here. The first is the Mixed Grille - it comes with char-grilled Mahi, deep fried golden brown jumbo coconut shrimp, and their signature baked Oysters Willy for $35. My second favorite is the Surf-N-Turf. It comes with 12 oz. NY strip and one-half pound of steamed snow crab legs. They season and cook their steak to perfection, and it melts in my mouth each time I order it. That dish comes in around $34. I would consider Bonefish Willy’s to be a medium- to high-range option with appetizers around $8 - $12 and entrees averaging about $20 - $35. Chart House is my third and final recommendation for a must-visit restaurant in Melbourne. 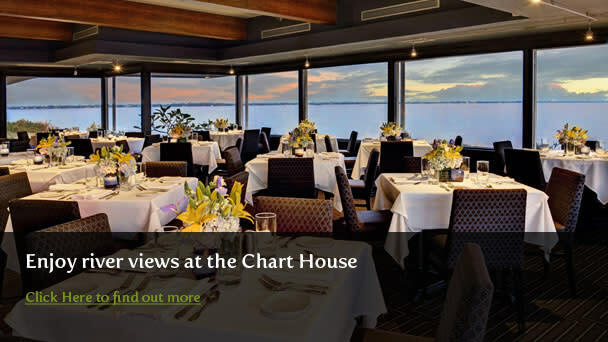 Another excellent restaurant that overlooks the Indian River Lagoon, Chart House is a high-end chain restaurant that offers seafood and steak in a relaxed and classy atmosphere. My husband and I have celebrated a couple of occasions at the Chart House, and their service and creative cuisines are always impressive. Honestly, I have never had a bad meal here, and while I haven’t tried everything on their menu, I can say with almost certainty that you can’t go wrong with anything on their menu. I have two favorite dishes at Chart House, and the first is their Lobster Bisque. I am very picky about my lobster bisque as it has to have just the right amount of spice and the perfect amount of lobster to get my seal of approval. The Chart House gets two thumbs up every time. My main entree recommendation is their Spiced Ahi. Be sure to get it seared because if it is cooked more than that, it will ruin the Ahi. Since they season the tuna perfectly, you don’t want to compromise that. And don’t forget their amazing salad bar! Chart House is a high-end restaurant that I would consider fine dining, so their starters average about $12 - $20 and their entrees about $35 - $45. This obviously isn’t everything on my “Eat & Drink Your Way Through Melbourne” list, but if I share everything with you, then you won’t come back to read more. I love trying new foods, especially around my hometown. It reminds me that you don’t always have to go far to experience great things; sometimes they are right in your backyard on Florida’s Space Coast. Tell me, what are some of your favorite Melbourne restaurants and eateries?